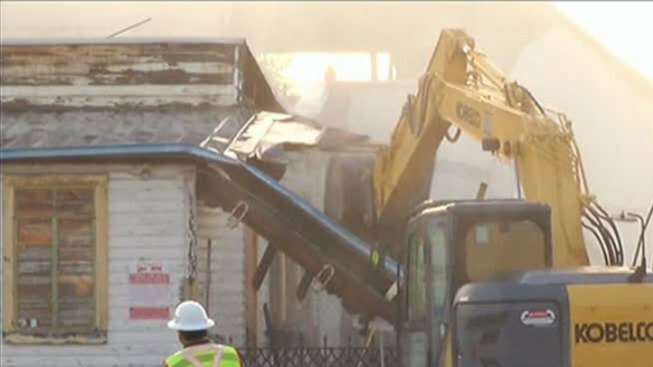 Demolition of a vacant former restaurant on Greenville Avenue in Dallas was stopped Monday morning after investigators found a woman's body inside the burned building. Heavy machinery began demolishing the vacant former Uncle Julio's location around 7 a.m. Monday, but work was halted when investigators found a body in the rubble around 7:50 a.m.
“She was nice. I feel sorry for her,” said nearby convenience store worker Almaez Fshayed. She believed she knew the homeless woman and wonders if the woman's boyfriend may have been trapped in the fire as well. After finding the woman's remains, and after learning she may not have been alone, rescuers searched but found no evidence of anyone else having been trapped inside. The medical examiner removed the woman’s body and her cause of death, and that of the fire, are both under investigation. Firefighters said they were aware homeless people often stayed in the building but insist the flames were too intense for crews to search inside while battling the fire. The three-alarm fire in an old Uncle Julio's location caused fire crews to close the road as they battled the blaze. Northbound lanes of Greenville were reopened around 6 a.m., but southbound lanes will be shutdown for an extended period of time. Around 11:50 p.m. Sunday night, Dallas firefighters responded to the fire in the 7500 block of Greenville Avenue. Fire was visible through the roof of the vacant structure when firefighters arrived. The interior blaze was so intense that firefighters could only work defensively from the outside. Parts of the roof have already collapsed due to the intense heat. The crews used several ladder trucks and poured thousands of gallons of water per minute onto the fire. Atmos Energy is headed to the scene to cut off the gas to the former restaurant. Once that's done, crews are planning to knock down remains and extinguish any remaining hot spots. The structure is a total loss.